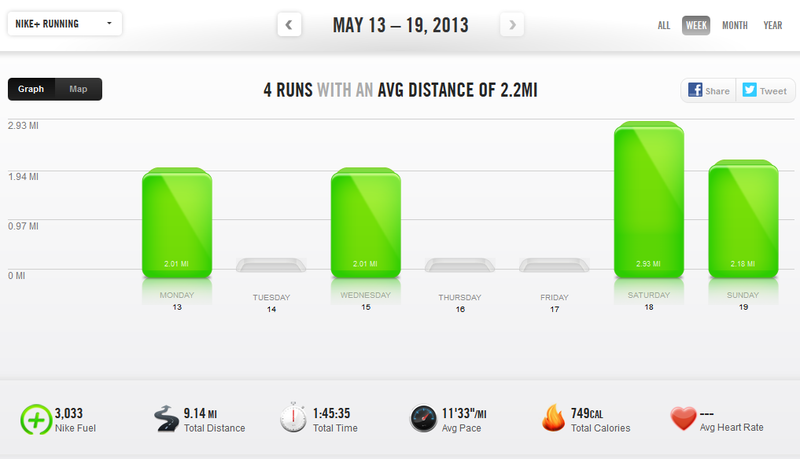 I tried to take it fairly easy this week, since Saturday was a race day. I was pretty sore from the previous day’s fartlek session on Monday, but I headed out to attempt to complete day 3 of week 6 of Couch to 10k. According to the description on the app, this meant I was going to have to run for 20 minutes with no walk breaks (*gulp*). I’ve done this once before on day 3 of week 5, but considering week 7 consists all of 25 minute runs, this time it meant something. My legs weren’t feeling great starting out, and I wasn’t really into it. I chugged through the first half mile kind of grumbling to myself. But after mile one, I started to feel really good. I thought to myself, “I wonder if I could actually go a little longer than 20 minutes. Maybe I could finish the whole second mile.” As it turned out, I could. And I had to, because the day’s description had lied, and I was actually meant to run 22 minutes. So I did 2 miles in about 22:25, a personal best, and almost a full minute off my 2 mile PR time from the day before. Now if I could keep up that time for the 5k on Saturday, I could blow my PR out of the water! Wednesday was a different story. It was a hot day and as soon as I started running, I knew it wasn’t going to be a repeat of Monday. My muscles ached and felt terribly stiff. I suffered through the first mile, walking quite a bit. The second mile was better, but I decided to go home, stretch, and rest my legs before the race on Saturday. I took Thursday and Friday off from running to make sure I was fully rested for race day. I detailed the Law Enforcement Memorial 5k yesterday, but if you didn’t read it, I will sum up by saying I broke all the records. Sunday, I went for an “easy” two mile run, completing week 7, day 1 of Couch to 10k. I had spent the previous night at my friend Amanda’s house, which is between Smyrna and Murfreesboro, so I went to the Smyrna greenway for this run. It was fairly flat, which was nice, but it was so HUMID. I actually found a gnat that had drowned in the sweat on the back of my neck after my run was finished. I guess I’m going to have to get used to the humidity though; summer hasn’t even officially started yet, and I’m due to run a 10k on July 4th! This entry was posted in Weekly Update and tagged couch to 10k, couch to 5k. Bookmark the permalink. It’s in the morning, obviously. I will still be at your house in the afternoon, lol.